With Congress gridlocked and unable to pass even the deeply flawed comprehensive immigration reform, activists around the country are successfully challenging the injustices inherent in US immigration policy and enforcement. Two weeks ago, hundreds of people inside the Tacoma (Washington) Detention Center launched a hunger strike against its private operator, GEO Group, demanding better conditions and a moratorium on deportations. Activists, who have held vigils outside the center for years, now gather every day to support those inside. A week later the strike spread to a GEO facility in Texas. According to Maru Mora Villapando of Latino Advocacy in Tacoma, in both locations the company has isolated the strikers and in Tacoma threatened to force-feed them. Driving on 1-25 north of Las Cruces, New Mexico, motorists are forced to detour through a U.S. Border Patrol checkpoint set up to enforce immigration and drug laws. Often, a friendly agent will ask the vehicle occupant (s) to affirm U.S. citizenship status before sending the traveler on his or her way. Occasionally, agents will simply peer into a car and wave travelers on without first asking questions. Officers can also ask more detailed questions, inquiring about the motorist’s background and comings and goings. Other times, drivers are asked to pull over for a vehicle search that might include a go-over by a dope-sniffing dog. American Civil Liberties Union (ACLU). Positioned just north of the official government checkpoint about 30 minutes from Las Cruces, staff from the ACLU’s New Mexico Regional Center for Border Rights, supported by community volunteers, greeted motorists at a scenic rest stop. *Congressman Gutierrez and Elvira Arellano Join Forces Again as the Human Rights Leader Returns to the Struggle in the U.S. Congressman Luis Gutierrez joined with Familia Latina Unida co-founder Elvira Arellano on Thursday, March 27th, in a homecoming for the now famous human rights leader. Yet the two veterans of the immigration struggle were not looking backwards. They joined with a delegation of over 300 Pastors and another 1500 community leaders outside the Federal Building to set a clear demand for the movement for the next 90 days. “First, we want the President to use his executive authority to extend the deferments he gave the dreamers to their parents and the parents of U.S. citizen children while Congress remains paralyzed by politics. Second, we want the President to extend emergency parole status to deported parents with U.S. citizen or dreamer children who are under threat of kidnapping and extortion so that they can return in safety to the U.S. while they pursue requests for asylum. Familia Latina Unida Co-Chair Emma Lozano joined Elvira Arellano in calling for 90 days of action. “We must stand against every single deportation and we must stand with every single family that has been separated to reunite them. We must organize mass civil disobedience. We must march and march and march until the streets are filled with our millions. What is clear now is that the road to passing legislation leads through the White House door of executive action. The threat of executive action is the only hope of bringing the congress to act. The reality of executive action is the only way reactionary members of the Republican caucus can be brought to the table. “We have wasted too much time knocking at the door of Republican Congressmen. Our unified vote convinced Republican Party leaders that their party can never win the White House unless they pass immigration reform, but they cannot act without rank and file Republicans. Those rank and file Republicans will never act to pass immigration reform as long as the President is deporting 1100 people a day – as long as the President is doing what they want. Speaker after speaker criticized the Obama administration for the assault on the Latino family and accused the President of treating Latino families as “disposables” in the political battles between Democrats and Republicans. Pastors pointed to Elvira Arellano’s seemingly miraculous return as cause for new hope in the movement in Chicago. Yet even as the Chicago leaders celebrated their unity and determination, the Pope met with President Obama, led by the call of a young girl seeking to free her father from deportation. With the Pope’s intervention, her father was returned to his family. After the rally in Federal Plaza, the pastors led the march to ICE headquarters where over fifty religious leaders and elected officials planted themselves in front of the doors, shutting down the offices until they were arrested. United Methodist Bishop Sally Dyck, among those arrested, called on all people of faith to stand with the immigrants in this life and death fight for justice and for human dignity. A hunger strike at a private GEO Group immigration detention center in Tacoma, Washington, has spread to another GEO facility in Texas after President Obama called for a review of immigration-enforcement policies last week. But will private prison lobbying ensure beds at these facilities stay filled? Adelina Cáceres doesn't understand why her husband, David Vásquez, who is a documented resident, remains detained at the privately run Joe Corley Detention Facility in Conroe, Texas, as a result of a prior charge he already served time for years ago. A Mexican woman who received widespread attention for taking refuge in a Chicago church before she was deported in 2007 was released from U.S. custody Thursday, two days after she sought permission to enter the country without legal documents. Elvira Arellano, 38, was paroled by U.S. immigration authorities with her 5-month-old son, Emiliano, who was born in Mexico. They are among about 150 people who have sought to enter the country without legal documents at San Diego's Otay Mesa port of entry since last week in a protest of U.S. immigration policies. Many planned to claim asylum. e agent with rocks. Reportedly fearing for his well-being, the agent, Daniel Basinger, shot his pistol twice, fatally wounding the alleged attacker. 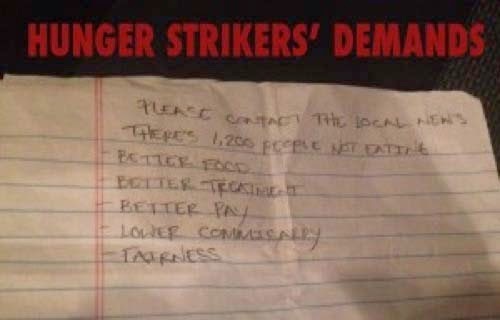 Support the Hunger Strikers in the Tacoma Detention Center! People in the detention center are risking their health by not eating and withstanding potential backlash for participating in the hunger strike. Sign below and share widely to support the hunger strikers and their demands. Not one more deportation! WASHINGTON — The Obama administration is planning new steps to prevent people in the country illegally from obtaining Medicare after finding that tens of thousands were improperly receiving benefits. In President Obama’s budget for 2015, to be unveiled on Tuesday, and in new regulations, the administration proposes to remove illegal immigrants from the Medicare rolls and explicitly require citizenship or lawful presence in the United States as a condition of getting Medicare. OLYMPIA, Wa. (Reuters) - Hundreds of detainees at an immigration holding center in Tacoma have gone on hunger strike to demand better conditions at the facility and an end to U.S. deportations, their attorney said on Saturday.